Using data from the National Science Foundation's South Pole Telescope and ESA's Herschel Space Observatory, astronomers have made the first detection of a subtle twist in the Cosmic Microwave Background, paving the way towards revealing the first moments of the Universe's existence. Cosmologists have achieved a first detection of a long-sought component in the Cosmic Microwave Background (CMB). This component, known as B-mode polarization, is caused by gravitational lensing, the bending of light by massive structures as it travels across the Universe. The result is based on the combination of data from the South Pole Telescope and ESA's Herschel Space Observatory. This detection is a milestone along the way to the possible discovery of another kind of B-mode signal in the polarized CMB - a signal produced by gravitational waves less than a second after the Universe began. The Cosmic Microwave Background is the most ancient light that has traveled almost unimpeded across the Universe, and it contains a wealth of information about the origin and nature of the cosmos. 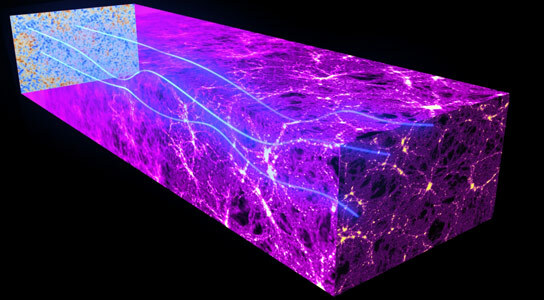 During their journey, photons from the CMB have encountered a multitude of galaxies and galaxy clusters and have been deflected by these large concentrations of matter. This phenomenon, known as gravitational lensing, imprints a subtle distortion on the pattern of the CMB that encodes details about the large-scale distribution of structure in the Universe. In recent years, cosmologists have detected the signature of gravitational lensing on the CMB temperature using data from ground-based and space-borne experiments, including the first all-sky image of this effect achieved using ESA's Planck satellite. A small portion of the CMB is polarized, and gravitational lensing also affects this part of the signal. In fact, the polarized CMB is an additional and even richer treasure trove than the unpolarized signal to use to explore the Universe's past. Now a team of cosmologists studying the polarized CMB has detected in it the signature of gravitational lensing, opening new and exciting possibilities to study the distribution of matter across the cosmos. This result is also the first detection of the elusive second component of the CMB polarization - the long-sought B-modes. The study is based on the combination of data from SPTpol, the polarization-sensitive receiver on the National Science Foundation's South Pole Telescope (SPT), and the SPIRE instrument on board ESA's Herschel Space Observatory. The SPT is a ground-based telescope, located in Antarctica, to observe the CMB to very high angular resolution in a small patch of the southern sky.